Van Soles flipped his way to victory in the Toyota Bassmaster Weekend Series, operated by American Bass Anglers, Florida Division 6 tournament, held May 18, 2013, on Lake Okeechobee. Running out of C. Scott Driver Park in the town of Okeechobee, Fla. to fish the 730-square-mile lake, the Haines City angler caught five bass weighing 17.06 pounds. He anchored his bag with a 7.69-pound bucketmouth that also took tournament lunker honors. For the Boater Division victory, Soles took home a check for $1,017 plus a $140 bonus for the big bass. In second for the boaters, Corey A. Roberts of Fort Meyers landed a five-bass tournament limit going 17.03 pounds. He anchored his bag with a 6.14-pounder to pocket $859. 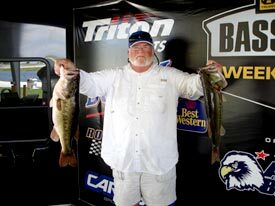 David M. Thomas of Lake Butler finished third for the boaters with five bass and 16.86 pounds. For the effort, he went home with a check for $572. Jim Gestwicki of Miami placed fourth with five bass and 15.57 pounds including a 4.52-pound kicker. Jared A. Dial of Winter Haven wrapped up the top five boaters with five bass at 15.16 pounds. In the Co-Angler Division, Tom Reeves of Land O Lakes won with three bass weighing 15.71 pounds for a 5.24-pound average. He upped his average with a 6.48-pounder that led the division big bass contest. For the win, Reeves earned $859 plus another $70 in big bass money. Taking second for the co-anglers, Ernie C. Johnson of Okeechobee brought in a three-bass division limit for 12.23 pounds. He collected $429 for the effort. Matt M. Surman of Orlando placed third place with three bass going 10.38 pounds. He anchored his bag with a 6.12-pounder to pick up a check for $286. In fourth place for the co-anglers, Nik C. Kayler of Apopka landed two keepers and finished with 8.26 pounds topped by a 4.76-pound kicker. Fred George of Okeechobee took fifth place among the co-anglers with a three-fish limit going 7.96 pounds. The two-day divisional championship will be held Sept. 14-15 out of Camp Mack near Lake Wales to fish the Kissimmee Chain. For more information on this tournament, call Billy Benedetti, tournament manager, at 256-230-5632 or ABA at 256-232-0406. On line, see www.americanbassanglers.com.